Pacific wren photographed by: Kim Wetten with the VIU Bird Banding Project (in hand); John Reynolds (calling and feeding); and Ian Thomas (juvenile wren, perched on branches). Note the distinctive short, upward-angled tail in the bottom left image. Like other wrens, this small, round bird holds its short and stubby tail in a distinct upward angle, which gives it an easily-recognized silhouette. Its colouring is fairly drab: dark brown overall, with black barring on the wings, and light spots dotting the wing edges. It has a lighter stripe above each eye, as well as on its chin, throat, and above the bill. Juvenile plumage is quite similar to adult. 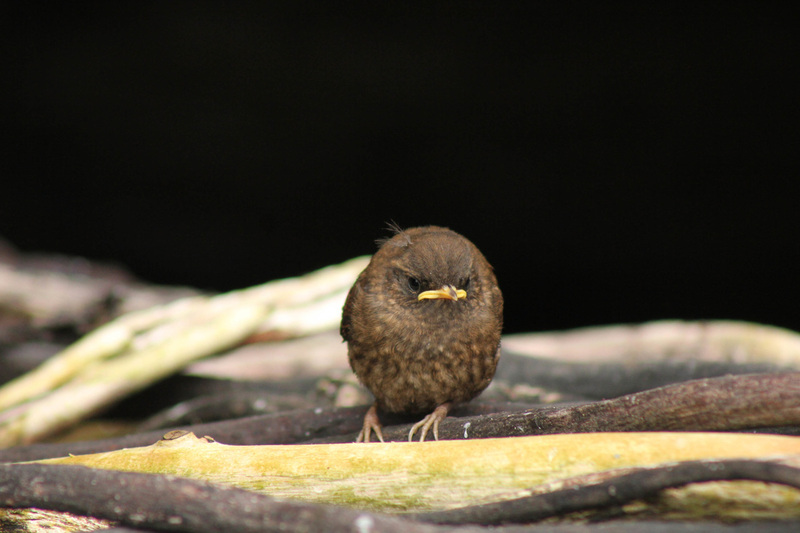 The Pacific wren's bill is small and pointed, varying from yellow to blackish. 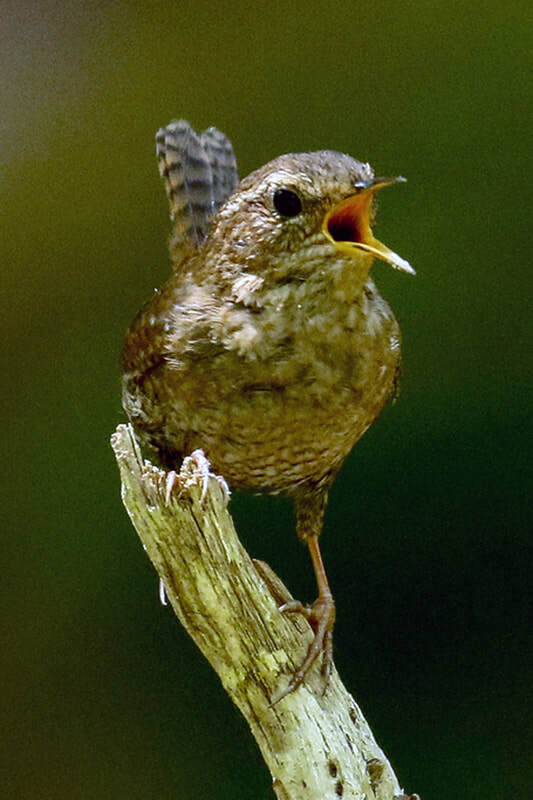 This small bird, which gets to 10 cm long, can also be identified by its disproportionately loud songs. They are long, complex and cheerful songs, which brighten up the dark forests they frequent. Click here to listen to examples. This species is a forest bird, generally found in wet, closed forest or forest edge. It is generally found in coniferous or mixed forests, only rarely occurring in forests dominated by deciduous trees. This species is commonly associated with old-growth forests, where logs, snags, and large trees provide abundant quality nesting and foraging habitat. Despite this strong association with forests, some populations do inhabit more open areas, such as some largely treeless but shrubby islands, as well as riparian corridors, disturbed sites, and in alpine habitats above the treeline. Click here for more habitat information. 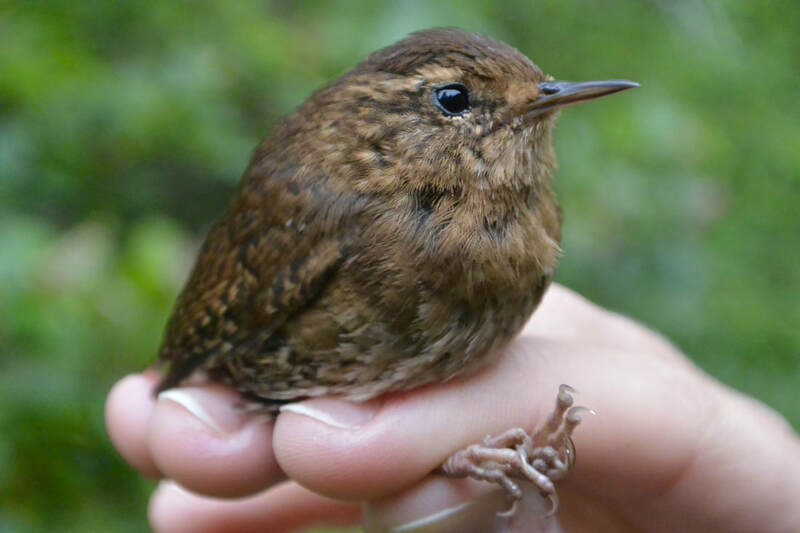 The year-range of the Pacific wren hugs the west coast of North America from Alaska south to California, extending further inland along some parts of this stretch, and transitioning to breeding- or winter-only range in other parts. Click here for a draft range map of this newly identified species. The Pacific wren can appear quite similar to the brown creeper (Certhia americana), but the birds are quite different in behaviour, as well as appearance: brown creepers are nearly always seen spiralling upwards on the bark of large trees, while Pacific wrens are found low to the ground, foraging near trees and dead wood. Brown creepers have curved bills and white bellies. The house wren (Troglodytes aedon) and Bewick's wren (Thryomanes bewickii) are found on BC's south coast. Both are larger, have longer tails, and are paler underneath than the Pacific wren. The western subspecies of the house wren is more greyish than the Pacific wren, while Bewick's wren can be differentiated by its bolder white eyebrow stripe. 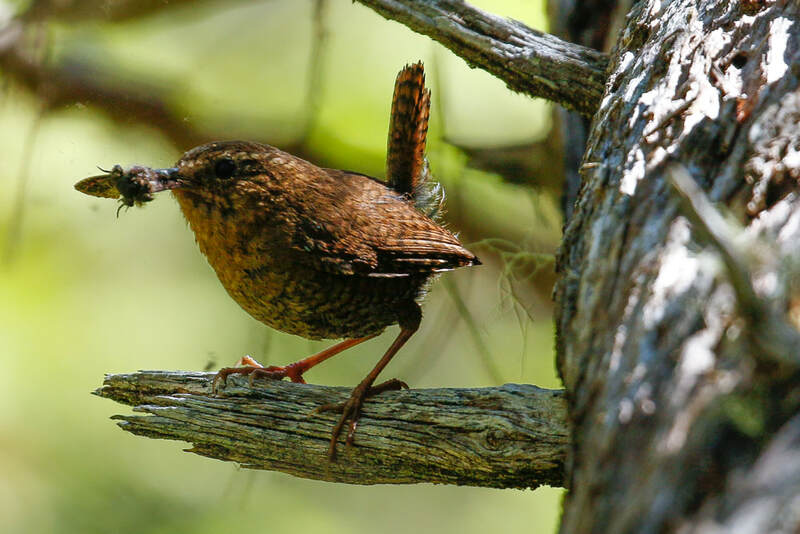 The Pacific wren was recently classified as a distinct species from the winter wren (Troglodytes troglodytes), as was the eastern winter wren (now Troglodytes hiemalis). These species are very similar, but can usually be identified based on range (see map; identification uncertainty may exist where the ranges meet in eastern BC/western Alberta). The species are also distinguishable by their calls and songs and some subtle differences in appearance. For more on the new species split (which happened in 2010), please visit the Sibley Guides website. The online Audubon Guide to North American Birds describes the Pacific wren as "a secretive gnome of western forests." Government of Canada. (2009). Pacific Wren (Troglodytes pacificus). Status of Birds in Canada. Environment and Climate Change Canada. Accessed 12/01/2016. Sibley, D. (2011). Distinguishing Pacific and Winter Wrens. Sibley Guides. Accessed 26/04/2013. Troglodytes pacificus (Baird) Pacific Wren. In Klinkenberg, Brian. (Editor) 2012. E-Fauna BC: Electronic Atlas of the Fauna of British Columbia. Lab for Advanced Spatial Analysis, Department of Geography, University of British Columbia, Vancouver. Accessed 26/04/2013. Winter Wren. Troglodytes hiemalis. The Birds of North America Online (A. Poole, Ed.). Ithaca: Cornell Lab of Ornithology. Accessed 26/04/2013.